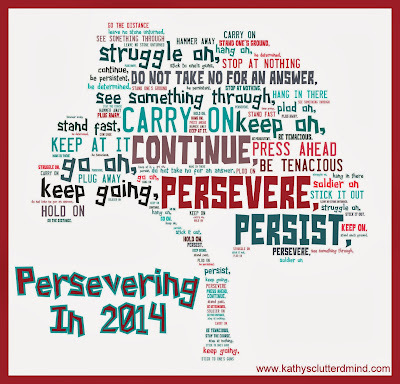 My word for 2014 is PERSEVERE! Persevere means, "to continue doing something or trying to do something even though it is difficult." I think many homeschool moms will agree with me that being a stay at home/homeschool mom is not an EASY job. Add in life stresses like a job, financial strains and health issues and it can make our job even harder. So this year I will be focusing on PERSEVERING in these areas homeschool, blogging/social media work and household chores. Perseverance is a special character trait because you can only use it when things are difficult. It is a character trait that ordinary people depend on just about everyday at work, home and play. Perseverance keeps us pressing on even when tough circumstances come our way. As mother's (especially homeschool mothers's) we definitely persevere everyday and it is our job as mother's to help our children persevere too. We as mother's need to hold our children's course steady and encourage them to use this valuable character quality. But perseverance cannot be taught. Instead we must set the example for our children. We must show them how we persevere through our own struggles and weakness and persevere along side them. 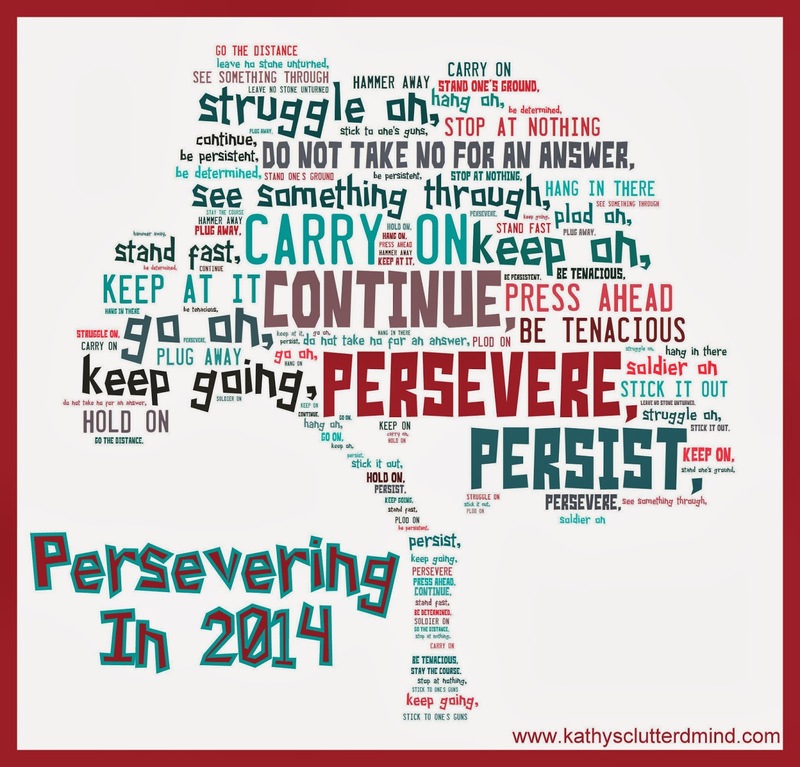 Here is how I am persevering and hopefully helping my children persevere as well in 2014! I firmly believe in our delight-directed/unschooling learning style but it can be really hard some days to trust that we have made the right choice. There were times this year I was second guessing our choices, comparing our homeschool to others and ready to throw in the towel on homeschool all together. In the New Year I will persevere and remember the reasons we chose to homeschool. I will remember that we want our children to have a love for learning and to follow their interests and dreams...NOT fit into a mold or box. I will NOT let the words of other break me down and second guess what we decided was right for our children and our family. I will help my children learn how to persevere when they are tackling something tough and getting frustrated by showing them how I persevere and by letting them know it is okay to fail and make mistakes. I will show them that patience goes hand in hand with perseverance. I will let them pursue topics that are meaningful to them. I will let them set their own goals and be there to support them and help them work through any difficulties that arise. I will provide all of the resources and environment they need to persevere. I will guide them on the choices they make so that they can find perseverance on their own. I will NEVER compare them to other children and will let pave their own path. There were several times this year when I was ready to give up on blogging and social media. It is very time consuming and hard work. It takes time away from other things I love doing like scrapbooking and hiking. And sometimes it even takes time away from my family. When I started blogging it was a fun way to document our homeschool journey and I hoped that along the way it would help a few fellow homeschoolers. But over the last 2 years it has become more than that and my tiny blog has grown more than I ever imagined it would. Blogging has allowed me to supplement our income and provide for our family. It has become a way for me to help fellow homeschoolers on their homeschool journey through valuable insight and resources. And it has allowed me to meet some really awesome people across the country and even the world who have become both "in real life" and virtual friends. I showed perseverance this year (with the support from my family) and will continue to press on in 2014. I will get more organized and stay caught up on projects and reviews. I will lighten up some of my commitments and focus my attention on my passions. I will utilize more of the valuable tools available to bloggers like scheduling apps. And in turn I will show my children through my own perseverance that hard work and persistence is possible in everything we do, even blogging. And that making sacrifices for my family makes all the hard work totally worth it! I think this is one everyone can relate too. You clean the house or even just a room only to turn around and find a mess again. Children are like mini tornadoes. They make messes and destroy just about every thing in their path. But with a little perseverance and teamwork household cleaning and organizing won't be difficult and exhausting. Be sure to read my New Year Cleaning Tips post too! In 2014 I will persevere in household chores by not being afraid to ask for HELP around the house even when I think I don't need it! I will ask EVERYONE to get involved, even the children, in cleaning and organizing. If children help to clean up messes, fold the laundry, wash the dishes, etc they will learn valuable life skills, perseverance, patience, time management and the value of helping others. It is up to you whether or not you offer incentives (we reward with $1 allowance each week) but either way children need to understand that as a family it is everyone's responsibility to clean up and help out around the house not just mom's. I have even had my children help with breakfast, lunches and dinner and they are only 6 and 7 years old. And did you know that learning to do tasks, helping out around the house, and being relied on by others in their family can help build self confidence and self esteem in children? As I was writing this post I thought of one more area I will show perseverance in for 2014 and that is my health. Some of you may know about my health struggles this year, which started a little over 4 years ago. Over the last 4 years I have seen countless doctors, had numerous procedures and accrued hefty doctor bills (some which are still unpaid). But a few months ago I had enough. I refused to become the medicated zombie that the doctors said I needed to become due to a garbage can diagnosis of fibromyalgia. I refused to continue living in pain, sleeping all day and pushing my family away. So I researched and researched and low and behold I found a great Chiropractor who was willing to help me heal my damaged body. Turns out I have metabolic issues, food allergies, a twisted atlas (small bone at the top of your spine on which you 12 lb skull sits) and an injured shoulder. What caused these issues is uncertain. It may have been the mold exposure from our house (that we left in 2009), my intestinal surgery (to correct the malroation of my small intestine in 2000), hormone changes from having children and/or the bad fall I had a couple years ago while ice skating. Or perhaps it was a compilation of all the above. But whatever the cause may be I am happy to report that I am healing. It has been a slow process and it will continue well into 2014. After all it took years to get this sick. But thanks to a caring doctor Cliff Griffin, gentle manipulations, amazing supplements, exercise and a restrictive diet I will continue to persevere in my health in 2014 and continue my road to recovery. 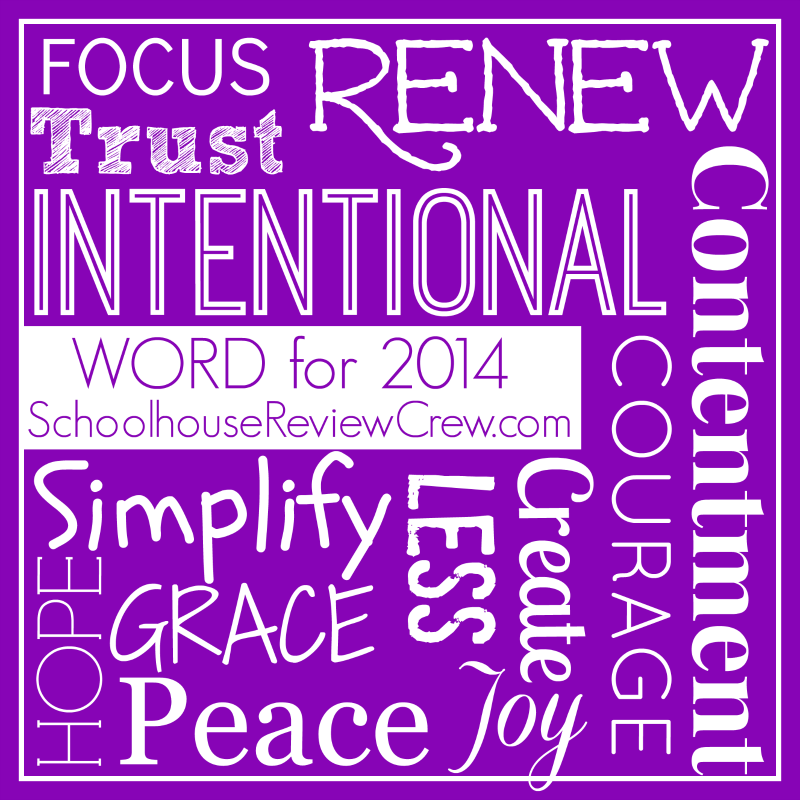 Also be sure to head over to Schoolhouse Review Crew Blog to read about more words for 2014 from the TOS Crew. Also in case you are interested here are my top 5 posts for 2013. *Please note many of the freebies above were limited time freebies and may no longer be available. Our family wishes you a happy New Year! May all your hopes and dreams come true and your perseverance pay off in 2014! love Mr. Clean products, they smell good and they clean the grime from my 5 kids! LOL! Great list of tips! I love Mr. Clean too! These are some great goals. I LOVE the word yu=ou chose for 2014. I really need to choose mine! I need to come up with my word for 2014!! I have seen a few people with goal words and I think it is an awesome idea. I love your word of PERSEVERE!! I need to think of a word for 2014...I keep seeing these blogging prompts and honestly, I don't have any big goals for the new year, aside from doing what I am already doing. So I am just going with HAPPY - because as long as I have that, nothing else matters! what a great post. i chose a word too and while i have a lot going on in my mind about it I didn't express it as well as you did. ?Consider it pure joy, my brothers and sisters, whenever you face trials of many kinds, because you know that the testing of your faith produces perseverance. Let perseverance finish its work so that you may be mature and complete, not lacking anything." Persevere is a great word for 2014! I've never done a word for the year. I've thought about doing it for this year, though. Great tips! I also love the reader poll! I think a lot of mothers and bloggers feel the same way! I know I did but I've learned that you can't compare yourself to others! You've got some great goals for the new year! I love the 1-minute rule - that's something I need to work on; I'm always procrastinating! And I like the idea of the kids helping by wearing superhero capes. I think my daughter will do anything if she can wear her cape at the same time! Thanks for the tips. I already started with closets this week. It was long overdue. These are all wonderful tips! My three older kids all have chores to do and that saves me so much time and helps them feel very important too! Wonderful verses to reflect on as the year closes. So many things that I want to focus on in 2014. This is a great post! I have to get my kids, especially my son, more involved in cleaning. We’re moving in with my mom for health reasons, and it throws off his responsibility meter. Grandma spoils him. We’ll be kicking up the cleaning schedule in January. Great word to carry you into 2014! It can be difficult to keep going when things get difficult. I have lots of goals in mind but I haven't decided on a specific word for the new year. Great Tips and awesome ideas! Great tips. I need to do new chore charts for the kiddos, theirs are about 2 years old and they are certainly capable of doing more! I made it a New Years Resorption to use more greener cleaning products, and to try and clean first thing in the morning! My three kids are like tornados too! I wish I was stronger, and had more patience. I homeschooled for one year, and my daughter was very unhappy! Seems like some of us have a WORD for 2014 - Mine is Mindfully. Doing all things with a thought first. Good luck with yours - I love it. I have been enjoying reading all the word of the year on the internet. It has been an interesting learning experience. I love this one minute rule idea! That's a great way to keep things tidy! I can't wait to use that! You have your goals in LINE! I am proud of you - and homeschooling isn't for me - I don't have the discipline AND the time for work. Good for you! The one minute rule is a fantastic idea. The peppermint oil for spiders is a great tip too! Great tips. When I homeschooled my daughter, we always had a mess in the house! Getting the kids involved is a great idea. Love the printables! Preserving is an awesome word to have. I am glad that you are on you way to healing and have found the true source if your pain. Maintaining a blog is such a struggle sometimes. It can be so enjoyable, but when it becomes a job it's so hard to keep up with it and not lose focus on your other priorities. Best to you as you persevere through it all! Thank you for this post. I am always second guessing homeschooling. We have not chosen any curriculum and we are just starting out and feeling our way through. I am soo happy to follow you in 2014 and read about your journey. My word this year is Balance! I look forward to connecting. I love having a one word resolution! And I love yours... I think mine will be stability! I love that everything rests on your faith. It's so true that without that we are lost! Here's hoping 2014 is fabulous for you! I love this post...as the new year comes in I always try to do better or find DIY cheaper ways to keep my home clean & tidy. Thank you for this information. What a great word for the new year! I can totally relate to the homeschool back and forth. I wish you all the best for 2014! Wow! This is a very powerful and inspiring post. I needed to hear this. I love reading blog posts that tell me exactly what I need to hear when I need to hear it. What a great word for the year! There are definitely some areas in my life where a little perseverance could pay off. Glad you kept blogging. This is my fifth year and it does take a lot of time, patience and planning so that it doesn't interfere with family events. We have six kids so I understand completely. Fabulous tips as always my dear! By the way, tell Rowyn to stop stealing my costumes. I can;t clean without my bandit mask and cape! I have no doubt that you will persevere and thrive in this year :) You are my hero! I love your word art! Persevere is a great word for 2014.